That's how you know you're finally in vacation mode. Cut yourself some slack while mostly sticking to your routine. Indulge in a treatment or two at the oceanfront spa cabana. Find an open fire pit and squeeze in a few more seats. Keep an eye on your mini sand construction crew, while getting a few chapters further in your beach read. You'll love relaxing on Medano Beach. Your children will love the Kid's Place Program. You're just an 11 minute drive away from Cabo San Lucas Country Club. Enjoy a refreshing drink or burger at the swim-up bar with poolside dining. Don't miss 2-for-1 drinks at happy hour! 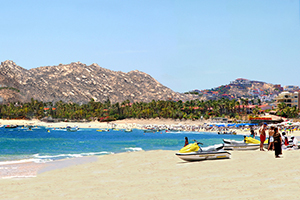 The Casa Dorada Los Cabos Resort & Spa has everything you need for a relaxing beach getaway. Once the kids are slathered in sunblock and have their water wings on, pick one of the two outdoor pools and jump on in. Work on your backstroke or challenge the kids to a game of Marco Polo. Feel like a drink? The swim-up pool bar has you covered. After the pool, surprise the kids with a stop at the on-site gelato shop for a treat. Let the kids hang out at the on-site children’s club while you get in a workout at the well-equipped fitness center or a massage at the on-site full-service spa. The outdoor lounge with fire pit is perfect for a relaxing evening. Studio condos sleep four guests and have kitchenettes where you can whip up the basics. One- to two-bedroom condos sleep four to six guests and have full kitchens should you feel inspired to get in touch with your inner Julia Child or Betty Crocker. Don’t feel like cooking? No problem, there are four on-site upscale restaurants that feature everything from sushi and seafood to authentic Mexican cuisine. Or order in, room service is available twenty-four-seven. Make it dinner and a movie thanks to the flat screen TV with premium cable and DVD players. Have the kids pack their favorite movies. Once the little ones have drifted off to dreamland, enjoy a relaxing soak in your jetted tub (in one- and two-bedroom condos). Wine optional, but highly recommended. But wait, there’s more! Casa Dorada is a pet-friendly resort, so your four-legged family member doesn’t have to miss out on your fun family vacation. The resort offers full concierge services. The Golf Concierge will be happy to help you book a tee time at nearby courses designed by Robert Trent Jones Jr. and Jack Nicklaus. Once you’ve tackled that land adventure, head out to sea with a day of deep sea fishing or a sunset sailing trip – it’s an easy walk to the yacht and fishing marina. Shopaholics will love Puerto Paraiso; it’s the largest mall in Cabo! Browse the apparel at Lacoste, Nautica, Kenneth Cole, or Tommy Bahama. You can never have enough swimsuits, especially on vacation. Check out the selections at Tropica Boutique, Beach House, Azul, and Bari. Pick up a new pair of sunglasses at Sunglass Island or a new pair of shoes at Skechers. Kids stay free! Children under 12 years old stay free when using existing bedding. Early departures are subject to the full cost of stay. For more details, please contact the office using the information on the reservation confirmation received after booking.